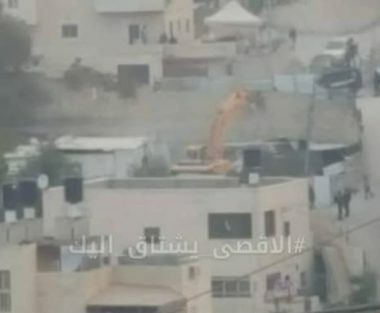 Israeli bulldozers destroyed a Palestinian family home Tuesday, in Occupied East Jerusalem WAFA reported. A large number of Israeli police officers and soldiers stormed the town of Jabal Al-Mukkaber, surrounded and blockaded the house, preventing residents from approaching, and restricting movement of others. The home was still under construction, and the reason given for the demolition was a lack of an Israeli issued permit, seldom awarded to Palestinians. 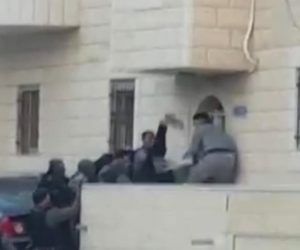 The soldiers assaulted the Palestinian family physically and verbally. The physical assault on Palestinians by Israeli forces were caught on video and posted on social media. In contrast, illegal settlements are expanded daily by Israel with no regard to the Palestinian residents living in occupied territories. Maan cites a report from the United Nations Office for Coordination of Humanitarian Affairs (OCHA) which states that 180 Palestinian families are facing eviction from their homes in Occupied East Jerusalem. The report clearly states that Israeli settler groups, with full cooperation of Israeli authorities, have attained control of property in Palestinian neighborhoods of Occupied East Jerusalem.